Without question, the European macro backdrop remains a complex one, and as such, we thought it might make sense to share some of our most recent macro findings after a late November trip through Europe. To this end, please find below some high level conclusions as well as some more granular details from our latest Thoughts From the Road. We do not foresee a triple dip in Europe, but below-trend inflation and Russia have dented CEO and consumer confidence – and hence, growth. 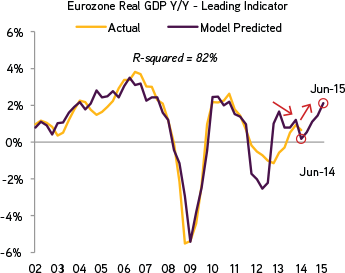 Our research leads us to pencil in European GDP at just 1.0% in 2015 and EPS around 5-7% versus a consensus of 12%. Economic differentiation in Europe continues to widen. 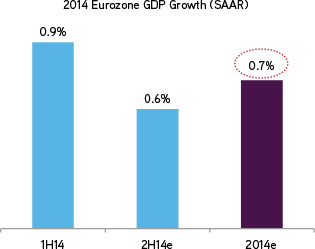 Just consider that Spain’s 2015 growth forecast is now twice that of France, while its GDP share is just half. As such, Spain is expected to make the same contribution to overall European GDP growth as France next year. 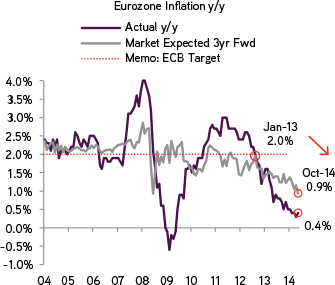 We believe deflation risk – though not Japanese style deflation – will be the European Central Bank’s (ECB) key policy issue for 2015. Importantly, we left with the sense that the bar for true sovereign Quantitative Easing (QE) may be higher than the market now thinks. Ultimately though, the ECB will have to engage in sovereign QE, given the lack of available credit instruments it can acquire in the open market under its current program, in our view. Regardless, the ECB is in motion, with the intent to 1) drive spreads tighter via a variety of new programs and 2) put renewed pressure on the currency (EUR). 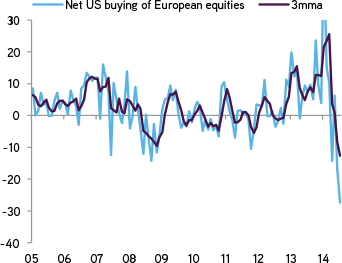 Post the latest round of warnings from the IMF, foreign investors have now sold out of European equities in epic proportions (i.e., positioning is now as clean as it has been since 2008/20091). 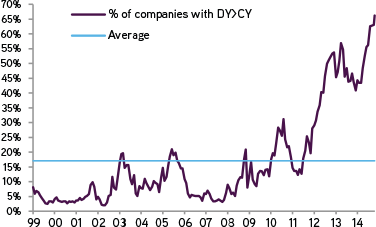 As such, as Exhibit 11 shows, 65% of European equities now have a dividend yield above their corporate bond yield (which is what we saw in the U.S. in 2010/2011, before the market rallied). Our macro thesis in Europe remains focused on Marginal Change (i.e., incremental capital will flow towards areas where things are getting better in Europe), but France and Italy — together 38% of Eurozone GDP — will continue to make the overall macro data look punk. We do not foresee a triple dip in Europe, but growth remains disappointing. While our quantitative models have been pointing towards an improvement in Europe’s growth – driven by lower rates, a lower euro and stabilization in housing – for several months, this is not what has happened. Why? We believe fears around Russia/Ukraine, the threat of deflation and slower global exports have all trumped the benefits of lower rates, a lower currency and a better housing outlook in Europe. We endured a similar experience with our quant work in the U.S. when Washington politics overwhelmed aggressive Fed action during 2010-2012. We would also be remiss if we did not acknowledge that leadership regimes in both France and Italy have both underperformed expectations. President Hollande’s approval rating is now a dismal 12%, essentially guaranteeing a quagmire until at least the next election. Our conversations in Paris with locals were downright demoralizing about the overall direction of the country’s economic policies. In Italy, the economy is now in its third recession since 2008. We know from a prior trip to Milan that Prime Minister Renzi’s ability to implement reform pales in comparison to the achievements that occurred in Spain post-crisis. However, this has not happened. Thus far, the ECB has largely just responded to crisis issues – not gotten ahead of them. Meanwhile, unlike the U.S. post 2008 (which spent $800B on fiscal initiatives), there has been no coordinated stimulus. If there is good news for investors, in our view, it is that the corporate sector in Europe has neither the leverage headwind nor the lack of leadership that the region’s governments are experiencing. e = KKR Global Macro & Asset Allocation estimates. SAAR = Seasonally Adjusted Annual Rate. Data as of November 14, 2014. Source: Eurostat, KKR Global Macro & Asset Allocation analysis. Data as at November 14, 2014. Source: Haver Analytics, Bloomberg, KKR Global Macro & Asset Allocation analysis. So where do we go from here? We now expect around 1.0% growth for 2015 – slightly ahead of the consensus but well below our quantitative model – at a time when U.S. growth and U.K. growth could approach 2.8% and 2.6%, respectively. We also expect earnings to grow closer to 6% versus a consensus of 12%. This 6:1 EPS-to-GDP ratio actually does not surprise us as the corporate sector in Europe has neither the indebtedness overhang nor the leadership problems that the government sector faces in the region. Importantly, if the Russia/Ukraine situation does not spill over into 2015, the upside from lower commodity prices could be a nice tailwind by 2H15. All told, we estimate that every $10 fall in the price of oil supports GDP to the tune of about 20 basis points per year over the following two years, and possibly more if consumers view the move as permanent. The decline in oil is not to be underestimated as it will be occurring at a time of ongoing wage pressure as Europe looks to get more intensive, so any relief to the consumer outlook is significant. Deflation: One of Europe’s greatest risks in 2015, in our view. Almost everywhere we went, ECB watchers, business leaders and investors were talking about the risk of deflation in Europe. Is Europe the next Japan and what does this mean for returns going forward? To be sure, we believe some caution is warranted. 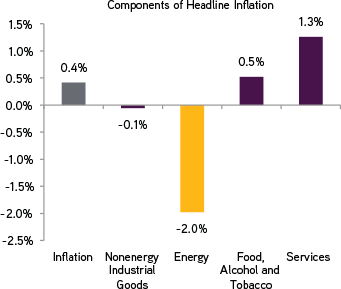 Indeed, if we use France as a proxy, we note that already one third of the input items in its CPI basket are now experiencing deflation2. Moreover, with commodity prices now falling, we believe there is the risk that overall Eurozone headline inflation touches zero at some point in 2015 (versus 0.4% in October, and 0.3% preliminary estimate for November) before rebounding (Exhibit 4). Data as at October 31, 2014. Source: ECB, Haver Analytics. Market expected inflation is as per Eurozone inflation swaps. Data as of October 31, 2014. Source: Eurostat, Bloomberg. For our nickel, we believe the Eurozone will avoid a sustained period of Japanese-style deflation. Wages in aggregate are still growing 1.2%, albeit the growth is coming mostly from protected areas of the economy, including unions and non-traded sectors3. Second, property prices in Europe have fallen just 6% versus 80% in Japan; importantly, a side-by-side historical analysis would actually suggest that housing in Europe is re-approaching affordable levels in many instances, which was not the case in Japan for a long time4. Third, corporate leverage in Japan was 50% higher when deflation began than it is in the Euro area today5. We left with the sense that the bar for sovereign Quantitative Easing may be higher than the market now thinks. True, Draghi said in mid-November that “the other unconventional measures might entail the purchase of a variety of assets, one of which is government bonds,” but our trip leads us to believe that — at a minimum — the macro backdrop will have to turn noticeably worse, including a further deterioration in inflation expectations, to push Europe’s central banker in fighting Germany over directly buying government bonds. Moreover, we think that Europe has more of a socialist bent, and both the central bank and its politicians know that QE favors the wealthy. One can see the magnitude of the issue through some of the work brought to our attention by my colleague Aidan Corcoran. 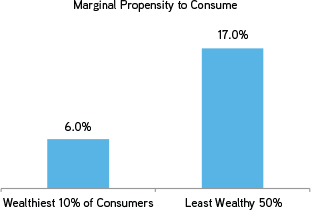 The Top 10% of Wealth Holders Have 52% of the Total Wealth…. Data refer to net wealth including real assets. Data as at November 2014. Source: ECB Household Finance and Consumption Survey. Data as at November 2014. 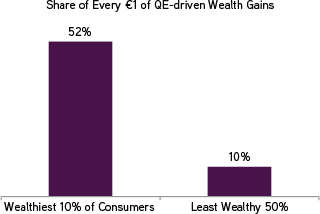 Source: ECB Working Paper: The Distribution of Wealth and the MPC. Expand the range of assets on the ECB’s menu. This initiative likely means looking at bank bonds, supranational bonds and government bonds if necessary. The ECB could even reach to ETFs (or drop a hint) if there is a further inflation scare. Target small and medium-sized enterprises (SMEs). We think the ECB attempts this by refining ECB T-LTRO terms to further favor SME lending, or by backstopping SME securitization via direct purchases, while continuing the push for capital relief on such securitizations. T-LTRO’s are targeted longer-term refinancing operations aimed at improving bank lending to the Euro area non-financial private sector. Undermine the euro. The two aforementioned levers will also do this, but we now think that the ECB may consider direct verbal assaults on the currency and/or become more aggressive on the timing or price of asset purchases to further reinforce the effect. As such, our research shows that a 1.15-1.20 euro to dollar exchange rate is achievable over next 12-18 months, particularly if the Fed increases rates by summer 2015. Ultimately though, there is a growing possibility that the ECB will be forced into large-scale sovereign QE by 2Q15, in our view. Key to our thinking is that the stock of eligible private assets in the Eurozone is just too limited, since banks do most of the credit transmission. To review, nearly 80% of credit extension still comes via the traditional bank lending market6. Indeed, as we show below, it is mathematically hard for the ECB to hit its stated goal of adding one trillion in assets to its balance sheet without essentially becoming the market in many instances. Figures show outstanding amounts. Data as at November 19, 2014. Source: ECB, KKR Global Macro and Asset Allocation analysis. 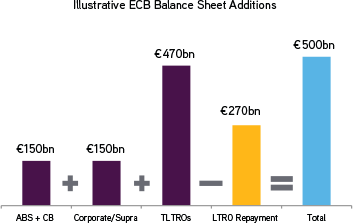 Moreover, as Aidan points out in the accompanying charts below, the ECB must contend with not only a smaller than expected take-up of the T-LTRO but also ongoing repayment of the prior LTRO. 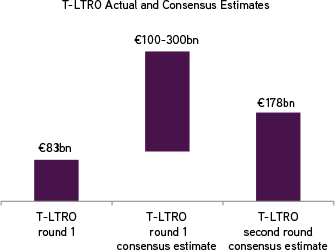 Indeed, first round T-LTRO “take-up” was just 83 billion euros versus consensus estimate of 100-300 billion euros. Data as at November 19, 2014. Source: Bloomberg, KKR Global Macro and Asset Allocation analysis. So our bottom line is that, despite resistance from Germany, as well as some of the social stigma associated with sovereign QE being a rich man’s game, we think that by 2Q15 the ECB will be forced to do sovereign QE to overcome not only the ongoing deflation threat we see but also the physical reality that it is hard to fulfill its pledge of one trillion in asset growth without expanding beyond the credit markets. Foreign investors have fled Europe in favor of dollar-based equities. As recently as 24 months ago, investor sentiment was actually more positive towards Europe, Latin America and Asia than it was towards the United States. Today by comparison, the United States is being put on a pedestal by investors, with all other countries apparently paling in comparison. We don’t disagree with the macro view that the U.S. is probably best positioned among the regional economies that we cover. However, everything has a price, particularly when GDP growth does not equal corporate growth (just consider that China’s GDP this year will grow 7%, but EPS will only grow 3%7). So while we fully acknowledge that Europe faces some important headwinds (which we highlighted above), there are two things that make us think value buyers and contrarians should find Europe at least somewhat interesting. First, as we show below, extreme selling by U.S. investors of European stocks reached a level in October 2014 that we have not seen since the Great Recession. Apparently, the IMF’s disclosure last month that Europe has some structural issues came as “new” news to many folks in the investment community. Second, some interesting valuation work done by the investment bank Goldman Sachs shows that 65% of European stocks now have a dividend yield above their corporate bond yield. This “mismatch” occurred in the United States during 2010-2011, and it represented an important signal that there was value in the market (Exhibit 11). Data as at November 14, 2014. Source: U.S. Treasury, Haver Analytics, Goldman Sachs Global Investment Research. Data as at October 21, 2014. Source: Datastream, Goldman Sachs Global Investment Research Adventures in Wonderland. Conclusion on Europe: More Needs to be Done. In our view, the marginal change thesis remains intact (see our Global Macro Insights piece from October 2013, Europe: Marginal Change Thesis Remains On Target), but the current disinflation cycle must be arrested to inspire more nominal revenue growth and valuation support. Against the macro backdrop we have described above, we continue to focus specifically on countries and sectors where there is positive macro momentum. Reformist countries like Spain and Ireland (whose GDP could grow by almost 5% in real terms in 2014) continue to deliver upside surprises — a trend we expect to continue. We also remain constructive on the Nordic region and the U.K., and we even heard that there are a growing number of companies reinvesting in parts of the periphery as conditions there improve. By comparison, we left this trip with even more concerns surrounding the outlook for both Italy and France, which collectively account for 38% of Eurozone GDP8. Data as at November 29, 2014. Source: Bloomberg. We also think it makes sense to appreciate what the current macro landscape means for sectors and companies. Based on the macro backdrop we envision for Europe over the next few years, we continue to believe that — all else being equal — investors should continue to avoid companies linked to government spending and/or traditional consumption on the Continent. Wage degradation and government belt tightening are now structural, not cyclical forces at work on the Continent, in our opinion. By contrast, we think that the consumer trade-down thesis is alive and well, a theme we heard confirmed by several executives with whom we did a macro roundtable. We also continue to find solid European companies poised to either consolidate a sector or take their business global. Within technology, substitution remains a compelling theme across media, business services, etc. Finally, bank deleveraging also remains an important theme, though we heard more about country champions and/or multinationals selling orphaned subsidiaries post-merger this trip than in the past. Overall though, we believe all of Europe needs to do more to address the deflation pressures that are mounting. History shows that taming inflation is often easier than taming deflation. We also think that any real growth improvement in Europe will require both outsized monetary and fiscal initiatives at the “federal” level. Finally, for Europe to break out of its current growth funk, big, important countries like France and Italy need to embrace some of the reformist lessons learned in places like Spain and Ireland. Ultimately, before the next downturn, the region needs to do more to get nominal GDP above nominal interest rates, in our view. Otherwise, when we do enter the next downturn, we think government debt levels in areas like France and Italy will move from outsized to unsustainable, which will put undue pressure on the “Union.” And unlike with a Greece or Cyprus, the stakes are much higher, given the sheer size of debt outstanding in Italy as well as the two countries’ contribution to Eurozone GDP. 1	Data as at November 25, 2014. Source: Goldman Sachs. 2	Data as at October 31, 2014. Source: Institut National de la Statistique et des Etudes Economiques, Haver Analytics. 3	Data as at November 6, 2014. Source: Credit Suisse, Deflation in Europe: Unlikely, But What if? 6	Data as at October 31, 2014. Source: ECB, Haver Analytics. 7	Data as at October 7, 2014. Source: IMFWEO, Factset. 8	Data as at September 30, 2014. Source: ECB, Haver Analytics.